Oscar winning and often controversial director Oliver Stone once said, “If anything, if you can get somebody interested in something and get them excited, that’s great. You should be praised for having opened the debate and having asked the right questions.” It is in this quote that I feel you will find the secret to creating a compelling video. 1: What Is My Goal? Whether it’s a 2-minute video highlighting the features of an online banking app or a 4-minute instructional demo of the latest healthcare management software, the objective of every technology video should be to drive the viewer toward a desired action. No matter what your objective might be, by identifying it before the creative process begins you can focus on building content that doesn’t distract your target audience from your intended message. 2: What Is My Message? Depending on the type of video you are creating you have between 2 to 4 minutes to deliver a message that will excite your audience to action. To make sure your message matches your goal make a list of what differentiates your product from the competitors and its’ must-have features. Once this list is compiled, discuss it with key members of your team and narrow it down to the top 3 or 4 that best support your overall marketing objective. 3: How Will I Build A Long-term Relationship? What happens once the viewer completes the desired action and converts to a lead or customer? Knowing how you will add value to the relationship before you begin the process allows you to make sure your video and supporting initiatives can effectively work together to foster long-term relationships. One approach could be to offer free access to webinars or a video series that will help your customers get the most from your product. Another way to reinforce long-term engagement is to promote awareness of your company’s Facebook and Twitter accounts as a means to gain exclusive perks and helpful tips. 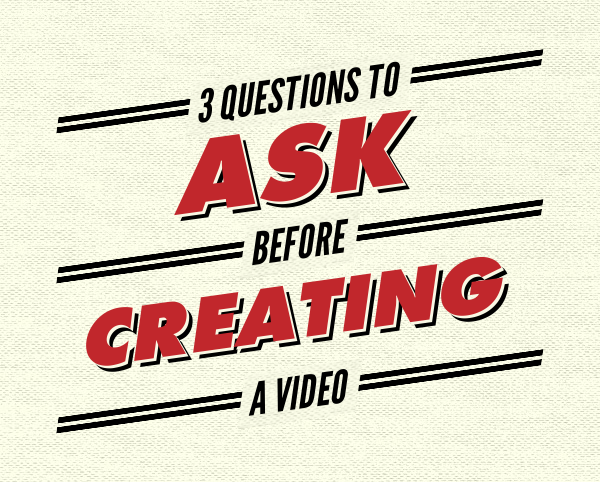 When getting started, use these questions as a guide and you will be on your way to creating a compelling video that drives your organizational goals. For more information on creating effective technology videos, contact us today. One of our experts will gladly answer your questions and help determine the best video solution for your organization.